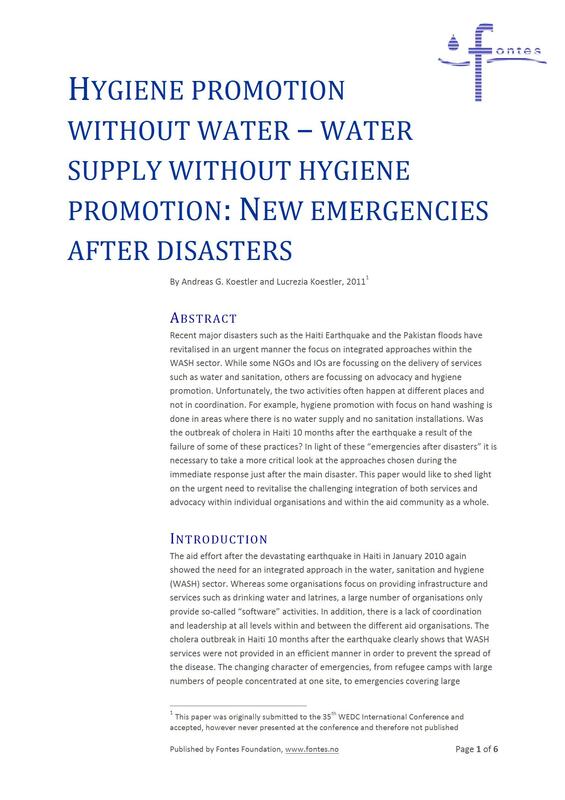 Recent major disasters such as the Haiti Earthquake and the Pakistan floods have revitalised in an urgent manner the focus on integrated approaches within the WASH sector. While some NGOs and IOs are focussing on the delivery of services such as water and sanitation, others are focussing on advocacy and hygiene promotion. Unfortunately, the two activities often happen at different places and not in coordination. For example, hygiene promotion with focus on hand washing is done in areas where there is no water supply and no sanitation installations. Was the outbreak of cholera in Haiti 10 months after the earthquake a result of the failure of some of these practices? In light of these “emergencies after disasters” it is necessary to take a more critical look at the approaches chosen during the immediate response just after the main disaster. This paper would like to shed light on the urgent need to revitalise the challenging integration of both services and advocacy within individual organisations and within the aid community as a whole.